“Imagine a singer with the virtuosity of Joan Sutherland or Ella Fitzgerald, the public persona of Eleanor Roosevelt, and the audience of Elvis, and you have Umm Kulthum, the most accomplished singer of her century in the Arab world,” writes Musicologist Virginia Danielson and present Interim Library Director of NYU Abu Dhabi. She is also the author of “The voice of Egypt: Umm Kulthum, Arabic Song and Egyptian Society in the Twentieth Century”. 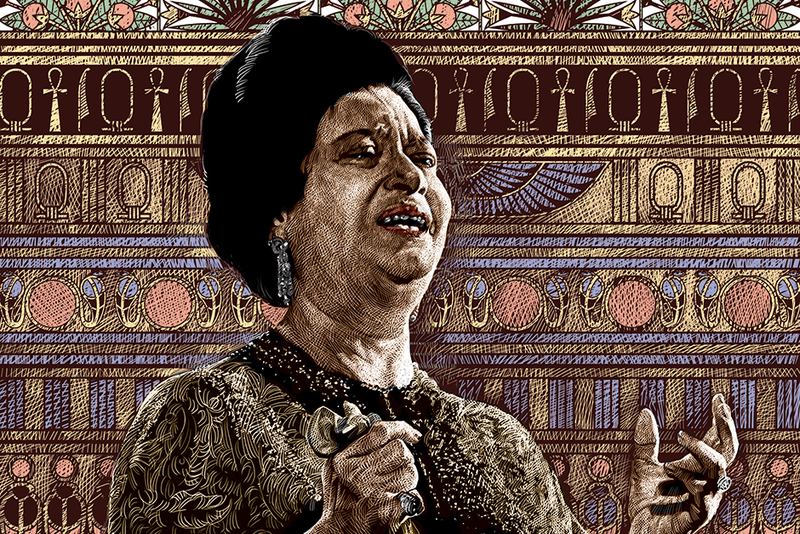 Umm Kulthum was a voice born in Egypt but one that transcended geographical and political boundaries and found its way into the hearts of all Arabs across the Arab world whether rich or poor, religious or non, white-collars or blue. She is an exceptional phenomenon who continues to be loved and celebrated today, 40 years after her death. Umm Kulthum recorded about 300 songs over the course of a career that spanned over 50 years, from about 1910 when she began singing with her father at weddings and until her illness in 1973. For almost 40 years, her monthly concerts were broadcast via live radio on the first Thursday night of each month reaching millions of listeners in Egypt and across the Arab world. Umm Kulthum typically devoted two or three songs to an evening of her concerts, with each song lasting between 30 and 60 minutes and divided up by lengthy breaks. The durations of her performances varied and were dependent on her interactions with her audience. She repeated a single line or stance over and over by altering her emotional emphasis and exploring different musical maqams (modal scales). Her audience’s appeals for repetitions of different stanzas fluctuated the length of the same song from 45 to 90 minutes, offering a different and unique experience for the same song. She was able to spontaneously produce multiple versions of the same line, and according to some, over 50 times in a row. It is said that she never sang a line the same way twice. There was always a personal relationship between Umm Kulthum and her audience during her performances. She would repeat lines again and again until her audience was satisfied. Her performances were more like spiritual encounters, romantic dialogues and amorous conversations with euphoric crowds cheering, whistling and shouting long-stretched “Allah” in praise and admiration. Umm Kulthum accomplished this goal during each of her renditions. The combination of her voice, lyrics and music captivated her audience and left them mesmerised by her mysterious musical powers. The streets of a most populated Egypt were nearly empty on the days of her performances as Cairo literally shut down while people rushed back to hear her concerts broadcast on radios. Gradually, the first Thursdays of the month became known as “Umm Kulthum Nights”, representing social occasions and gathering for admirers. Umm Kulthum was born Fatima Ebrahim Al Sayyid Al Biltaji in the village of Tammay Al Zahayra, belonging to the city of Al Sinbillawayn in the province of Daqahliyya, Egypt. Her date of birth is not known for certain but is reasonably estimated to be May 4, 1904. Her father, Shaikh Ebrahim was imam of the local mosque and sang religious songs at weddings and other celebrations for extra income. He taught his daughter the Quran and she is said to have memorised it. She later learnt to sing as she overheard her father teaching songs to her brother. As her father discovered the strength of her voice, he began to take her along to chant Quranic verses and sing religious hymns. In order not to risk his daughter’s reputation and expose her to public disapproval, he dressed her as a boy in a coat and Bedouin head-covering while she sang. Egyptian society, at that time, considered singing a disreputable occupation, especially for a female. At 15 years old, she was noticed by Al Shaikh Abul ‘Ila Mohammad, a modestly famous singer, and a few years later, she met the famous composer and oudist Zakaria Ahmad, who invited her to Cairo. Shortly after, Umm Kulthum’s father agreed to allow his daughter to sing at a wedding in Cairo. It was also then that she met religious singer Ali Al Qasabji whose son, renowned oud virtuoso and composer Mohammad Al Qasabji, later composed many of her songs and was the first to form a small orchestra for her. To improve her musical abilities and achieve a sophisticated musical style, she began to study music and poetry with accomplished performers and literati. By the mid-1920s, she had made her first recording, and by the end of the 1920s, she had become a sought-after performer and one of the best-paid musicians in Cairo. Her success in commercial recording eventually extended to radio, film, and television, and in 1936 she made the first of her six motion pictures, “Wedad”, in which she acted the leading role. Umm Kulthum was quickly noticed by the press. Her repertory of religious poems and hymns gave way to new and modern love songs that were composed especially for her. The season of 1926 is considered to have been a turning point in Umm Kulthum’s career. She sang an increasing number of new romantic love songs written by romantic poet Ahmad Rami and composed by Mohammad Al Qasabji. Of the 300 songs of her musical career, approximately one third were written by the poet Ahmad Rami. By 1928, Umm Kulthum was ranked as one of Cairo’s top performers. 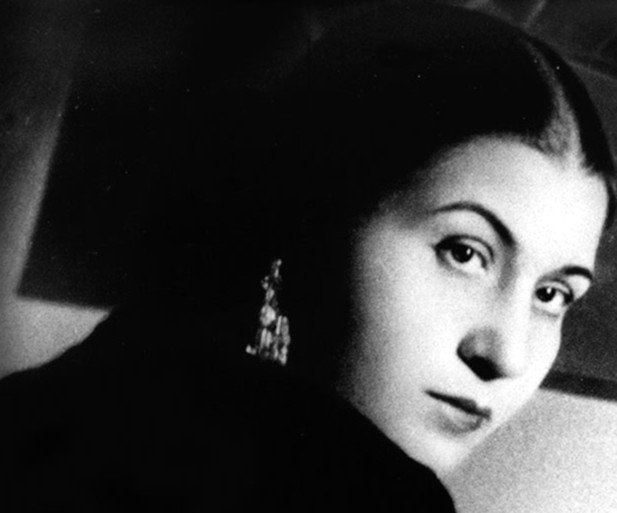 As her reputation grew in the Arab world during the 1930s, she embarked on a major tour of the Middle East, performing in cities such as Damascus, Baghdad, Beirut, Tunis, and Tripoli, Libya. Later in her career, she was invited to provide national songs for other countries and recorded songs for Kuwaiti National Day twice during the 1960s, and an anthem for Iraq. In the midst of the turmoil of two world wars, the Great Depression of the 1930s, and the 1952 Egyptian Revolution, Umm Kulthum established a public persona as a patriotic Egyptian and a devout Muslim, explains Virginia Danielson. Umm Kulthum was a political voice and an advocate for social and political issues. She was also known for her charitable contributions to the Egyptian military efforts. After Egypt’s defeat in the Six-Day War in 1967, she toured the Arab world on Egypt’s behalf and donated the proceeds of her concerts, an estimated $2 million(Dh7.43 million), to the Egyptian government. In her book on Umm Kulthum, Virginia Danielson writes that a friendship developed between Umm Kulthum and President Jamal Abdul Nasser in the 1950s and that the connection between the two figures “remains strong in the collective memory to the present day”. Danielson further explains that Umm Kulthum and Abdul Nasser had much in common as “both were from the lower classes and had utilised opportunities for upward mobility new in their lifetimes. Both were powerful personalities who became skilled in reaching the Egyptian population”. It is further suggested that President Jamal Abdul Nasser gained much from his association with Umm Kulthum, and he decorated her with state awards, featured her on international radio broadcasts, and invited her as a close family friend to end the fast at his home on the first nights of Ramadan. She gradually became an ambassador of his social agenda. It is also said that Abdul Nasser scheduled his speeches to broadcast directly after her performances. Later, she became a participant in the formulation and administration of cultural policy and served on committees for music formed by government ministries. The 1940s were the golden age of Umm Kulthum. As political and economic strains of the world wars penetrated Egyptian society, musicians and performers articulated the plight of the people and their hardships through their music and song. “Egyptian audiences applauded works that dealt with tangible reality,” explains Danielson, and “the romantic themes of the 1930s seemed remote from the deteriorating conditions of everyday life”. Hence, Umm Kulthum’s songs turned to echo the language of the working-class people and were infused with themes of their every-day lives. It was also during this time that Umm Kulthum requested pieces from Bayram Al Tunisi, a well-known colloquial poet and political satirist, as well as music from composer Zakaria Ahmad, both of whom applied an indigenous Egyptian style infused with political overtones supporting social justice and Egyptian self-rule. She also engaged the younger composer Riyad Al Sunbati in her work; the collaborations yielded phenomenal pieces for Rami/Sunbati and Al Tunisi/Ahmad. 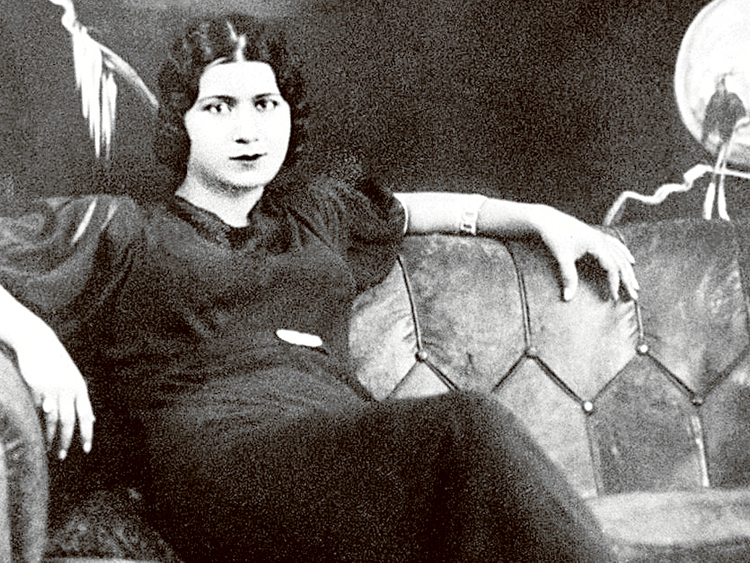 In 1946, Umm Kulthum premiered five poems in rapid succession for renowned Egyptian poet Ahmad Shawqi, also known as “The Prince of Poets”, with music composed by Riyad Al Sunbati. Of these poems was “Salu Qalbi” (Ask My Heart), a text written in 1914 by Shawqi in commemoration of Prophet Mohammad’s (PBUH) birthday in March. In 1956, Umm Kulthum began working with composer Mohammad Abd Al Wahab. One of his first works for her was the enchanting “Enta Omri” (You are my life) and was followed by a number of breathtaking songs such as “Amal Hayati” (The hope of my life) and “Fakkarouni” (They reminded Me). for patience also has its limits, my beloved. This life is a book and you are its thoughts. This life is nights and you are its essence. This life is eyes and you are its sight. This life is a sky and you are its moon. Other renowned composers for whom Umm Kulthum sang were Mohammad Al Mougi, Sayyed Mikkawi, Baligh Hamdi. In 1944, Umm Kulthum was awarded by King Farouk I of Egypt with the highest level of orders, Nishan el Kamal (The Order of the Virtues), which was reserved exclusively to female members of the royal family and politicians. She also became president of the Egyptian Musicians Union, a member of the government committees on the arts, and a cultural emissary to other Arab nations. Many health problems plagued Umm Kulthum throughout much of her adult life. In 1971, her health began to quickly deteriorate, forcing her to postpone some of her concerts. Most notable were problems with her eyes (purportedly from years spent in front of stage lights), forcing her to wear heavy sunglasses, which became a hallmark during her later life. She was diagnosed with a serious kidney infection in 1972. On January 21, 1975, she suffered a final kidney attack that led to her death on February 3, 1975. Her funeral procession became a national event and drew more than four million people to the streets of Cairo, a number that is said to have exceeded the state funeral of Egypt’s beloved Jamal Abdul Nasser’s. It was a dark day saturated with tears and hysterical grief. Today, four decades later, Umm Kulthum is remembered by the majority of Arabs as the most distinguished female singer in Arab music history. If you are an Arab, you are most likely to agree that there is nothing that can be said about Umm Kulthum that would do her justice. If you happen to be unfamiliar with Umm Kulthum, I encourage you to listen to her “Alf Layla wa Layla” (One Thousand and One Nights) or “Laylet Hub” (A Night of Love) or “Hazihi Laylaty” (This is My Night) — the list is endless — and I assure you that her performances will take your breath away!